Every driver has a core fan base. The fans wear their driver’s sponsors and number on hats, t-shirts, and jackets, perhaps on a cooler or stadium seat, and most certainly on a flag to fly proudly during race weekends. But one driver has a collection of fans so committed, passionate, and loyal that they outshine all other fans in the sport. 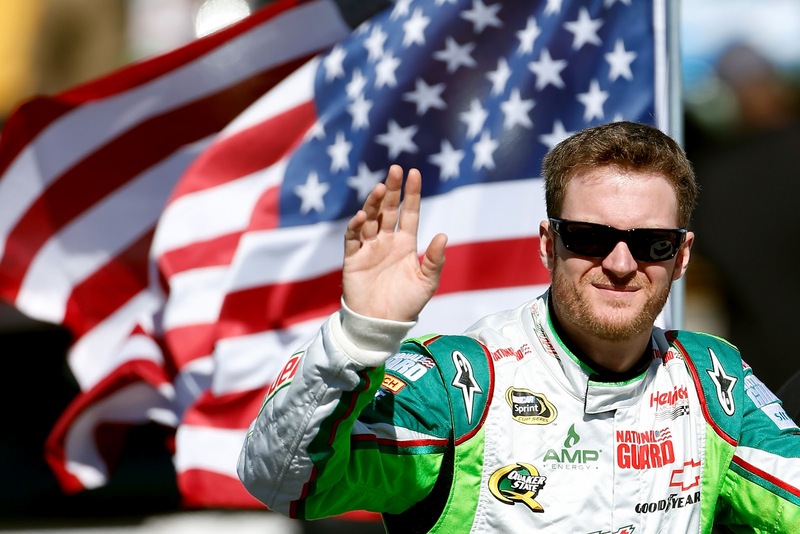 Dale Earnhardt Jr. has earned the hearts of his fans for well over a decade. He started early in his career amassing a fan base while running successfully in the Nationwide Series and winning back-to-back championships in 1998 and 1999. Those fans undoubtedly liked the young, attractive, shy, and talented driver whose father loomed largely over him in post-race interviews. His father, Dale Earnhardt, is another contributing factor to Earnhardt Jr.’s fan base. Earnhardt’s tragic death at the last lap of the 2001 Daytona 500, a race that saw his Dale Earnhardt Incorporated drivers Michael Waltrip and Earnhardt Jr. come in first and second, left a gaping hole for the legions of Earnhardt fans. Obviously Earnhardt Jr. was a logical choice for many to support as their driver. So Earnhardt Jr. inherited fans. But I know many of Earnhardt Jr.’s fans simply adore him; their tenure in the sport does not stretch back to when his father raced. He is the driver they latch on to and refuse to let go. And it’s this blind loyalty that raises the ire of so many of Earnhardt Jr.’s detractors. They site that he has run poorly in recent years yet still has a ride, a fact that countless other drivers would not have been able to boast if their record were identical to Earnhardt Jr.’s. These critics, in some cases, accuse NASCAR of giving Earnhardt Jr. preferential treatment, concocting conspiracy theories about debris cautions, Lucky Dogs, and the like. The “Golden Boy” would have a slew of championships if those plots were true. Earnhardt Jr. has had a solid career if not a stellar one. He boasts 19 wins in his Cup career which places him in the same company for wins as Carl Edwards, Fonty Flock, Buddy Baker, and Davey Allison (39th on the list of all-time winners). And for those who complain Earnhardt Jr. hasn't done much of late, it is gratifying to point to the last two seasons. In 2011 Earnhardt Jr. raced his way into the Chase and finished the season seventh in points with 12 top-10s, 4 top-fives, and no wins. This season has been an even better one to date. With six races yet to run, Earnhardt Jr. made the Chase again and has posted 18 top-10s, 10 top-fives, and one win. Regardless of Earnhardt Jr.’s rank at the end of the season, his fan base is securely in place. His “nice guy” image, gentleman racer personality, and marketability combine to keep him vastly popular within NASCAR. “Jr. Nation” proudly supports their driver no matter what. Some may think it is irrational, but it is real. As an observer I find this phenomenon fascinating. The Earnhardt Jr. Fans I’ve come in contact are overall super nice. Their passion for their driver and their optimistic approach to every race offers a neat perspective of fandom. 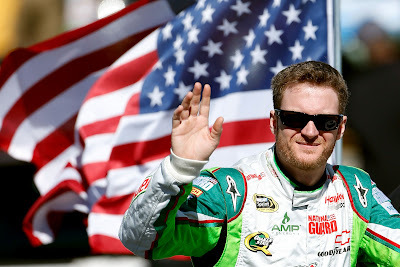 It’s been great watching Earnhardt Jr. enjoy success on the track once again in recent years. No matter the outcome this season, Dale Earnhardt Jr. is yet another reason why I love NASCAR. Absolutely, this is why "I Love Nascar". I just hope Earnhardt Jr can add 2012 championship to his list of accomplishments. No matter, I will still be a Earnhardt Jr fan.